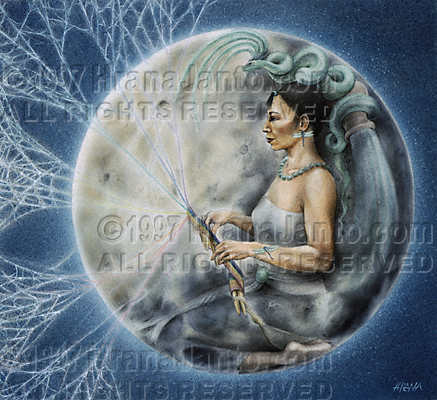 I painted Ix Chel in 1992 for Llewellyn's 1993 Goddess Calendar. She is included in the Goddess Oracle. Among the Maya of the Yucatan peninsula, this was the name of the snake goddess of water and the moon, of childbirth and weaving. Once, it was said, she took the sun as her lover, but her grandfather hurled lightning jealously at her, killing the girl. Grieving dragonflies sang over Ix Chel for 13 days, at the end of which time she emerged, whole and alive, and followed her lover to his palace. But there the sun in turn grew jealous of the goddess, accusing her of taking a new lover: his brother, the morning star. He threw Ix Chel from heaven; she found sanctuary with the vulture divinity; the sun pursued her and lured her home; but immediately, he grew jealous again. Ix Chel, weary of the sun's behavior, left his home and his bed to wander the night as she wished, making herself invisible whenever he came near. The night-riding goddess spent her energies in nursing the women of earth through pregnancy and labor, taking special care of those who visited her sacred island of Cozumel.